Samsung is a technology conglomerate popularly known for its consumer electronics products, which in this SWOT analysis relate to business competitive strengths that keep the enterprise a major player in the international market. A SWOT analysis of the corporation indicates the most relevant strengths, weaknesses, opportunities, and threats in the technology business and its operating environment. In the SWOT analysis framework, the external analysis of the corporation refers to opportunities and threats that relate to strategic factors identifiable in a PESTEL/PESTLE analysis of Samsung. On the other hand, in this framework, the internal analysis specifies the company’s strengths and weaknesses, which affect business development compared to competitors like Apple and LG. Samsung’s generic strategy for competitive advantage and intensive strategies for growth can be seen as responses to the internal and external strategic factors discussed in this SWOT analysis of the enterprise and its multinational industry environment. Based on the SWOT analysis framework, the strategic objectives and solutions of Samsung Electronics and other divisions and subsidiaries of the Samsung Group aim to address competition involving various technology companies, especially Apple, Google, Lenovo, Sony, Dell, Acer, LG, and Intel. These competitors have strong industry positions and organizational resources and capabilities to erode Samsung’s market share. Capturing the opportunities shown in this SWOT analysis helps the company remain a major competitor in the international market. 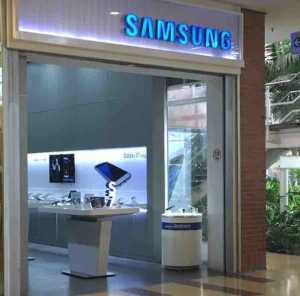 The Samsung brand is one of the most competitive in the global market, especially for consumer electronics. The brand rivals some of the biggest names in the industry, such as Apple, Google, and Sony. This strength is an internal factor that supports Samsung’s ability to grow and expand against competitors. This SWOT analysis also identifies the company’s design and manufacturing expertise for the semiconductors and electronics markets. This strength is notable, considering that major technology companies use Samsung electronic components in their respective finished products. Another strength in this case is the synergistic support involving the technology company’s divisions and subsidiaries. For example, Samsung Electronics benefits from the conglomerate’s semiconductors business. This synergistic support is based on the divisions and subsidiaries in Samsung’s organizational structure. The internal factors in this aspect of the SWOT analysis are used in the enterprise’s strategies for growth and to compete in the saturated global market for consumer electronics. Samsung’s dependence on Android OS is a weakness that limits business capabilities. For example, the company’s smartphone’s operating-system functions and related licenses are restricted because of Google’s licensing of Android. Also, Google’s influence on Android development weakens Samsung’s competitive position, as both of these companies directly compete in the market for smartphones and other mobile computing devices. In relation, this SWOT analysis points to the lack of a competitive platform to rival Apple’s ecosystem of hardware, software, and services. This internal strategic factor makes Samsung relatively weak in increasing the switching cost of its customers when deciding to purchase consumer electronics from the competition. The weaknesses shown in this aspect of the SWOT analysis are internal strategic factors that prevent the company from offering an expansive product range and further strengthening customer loyalty relative to Apple and Google. This SWOT analysis considers strategic partnerships with software developers as an opportunity to grow Samsung’s revenues, considering the company’s design, development, and manufacturing capabilities. For example, exclusive partnerships with software developers can provide additional functionality to make the company’s consumer electronics more competitive. Similarly, strategic partnerships with online service firms are an opportunity for stronger competitive advantage. This external strategic factor refers to possible exclusive agreements between Samsung and other firms. Spotify already has a non-exclusive agreement with the mobile device maker to make the music streaming service an integrated part of Samsung mobile devices. Another opportunity significant in this SWOT analysis is to grow the business through product development, such as in the form of new or improved variants of semiconductors and electronics products. This external factor is an opportunity to boost the technology conglomerate’s competitive advantage through its products’ features. Samsung’s organizational culture and related human resource management capabilities can support strategies for exploiting product development opportunities in global markets. In addition, diversification is an opportunity to grow the business in terms of entering new industries or businesses, although exploiting this opportunity present risks that could harm the company’s semiconductors and consumer electronics businesses. The external factors in this aspect of the SWOT analysis indicate the favorable business environments where Samsung can grow its revenues, increase its market share, and improve overall competitive advantages. Competition is the most significant threat relevant in this SWOT analysis of Samsung. This external strategic factor refers to competitive pressures from firms like Apple, Google, Sony, Lenovo, and LG. These competitors are capable of reducing Samsung’s market share and corresponding sales revenues. In relation, imitation is an external factor that threatens the company, especially in market segments that are price-sensitive. For example, cheaper phones that partially imitate the company’s smartphone designs are attractive among price-sensitive customers. Considering this SWOT analysis, the combined threats of competition and imitation are further understood through a Five Forces analysis of Samsung and its competition environment. Legal restrictions and lawsuits are also external factors that threaten the company in terms of possible limitation of business performance, especially in major mobile technology markets like the United States and the European Union, where Apple and other competitors are actively pursuing legal avenues. The threats identified in this SWOT analysis persist against Samsung and, thus, require strategies to mitigate their effects on the business and to maintain the company’s competitive advantage. The strengths, weaknesses, opportunities, and threats in Samsung’s businesses and industry environment present a competitive situation that requires innovative strategies to continue business growth despite competition. As this SWOT analysis indicates, the company possesses core competencies for capturing a bigger market share, increasing sales revenues, and growing the technology business operations. However, Samsung’s weaknesses are barriers and challenges that require strategic solutions. For example, it is recommended that the company exploit the identified opportunities, such as strategic partnerships, to strengthen its competitive position in the international market for consumer electronics. This SWOT analysis also emphasizes Samsung’s weakness of the lack of a competitive comprehensive platform similar to Apple’s. It is recommended that Samsung use the previously mentioned partnerships or develop its own platform to target certain services that could open new opportunities for growing its business. In addressing the issues identified in this SWOT analysis, the corporation can expect a continuously strong industry position, and possible mitigation of the effects of competition, imitation, and other strategic issues. Helms, M. M., & Nixon, J. (2010). Exploring SWOT analysis–where are we now? A review of academic research from the last decade. Journal of Strategy and Management, 3(3), 215-251. Piercy, N., & Giles, W. (1989). Making SWOT analysis work. Marketing Intelligence & Planning, 7(5/6), 5-7. Samsung Electronics Co., Ltd. – Annual General Meeting of Shareholders. Samsung Strategy and Innovation Center – Innovation. Sodhi, M. S., & Lee, S. (2007). An analysis of sources of risk in the consumer electronics industry. Journal of the Operational Research Society, 58(11), 1430-1439. Valentin, E. K. (2001). SWOT analysis from a resource-based view. Journal of Marketing Theory and Practice, 9(2), 54-69.